Microsoft a publié la version 2.4 de l'interface SDN pour Skype for Busness 2015. Powershell interface for provisioning: Windows Start Menu contains a Powershell shell that allows execution of provisioning commands similar to the command line provisioning interface. In addition, a SubscriberStatus and Status API has been added to allow querying some basic statistics for the state of the overall SDN interface and the state of the connection to each subscriber. See Powershell Provisioning for details. Per Subscriber PII Obfuscation: You can now set an obfuscation seed for each subscriber ensuring that the seed provided contains unique identifiers representing your SIP aliases and telephone numbers. See Per Subscriber Obfuscation for details. Some new requested fields have been added to Schema D. This might break backward compatibility with some receivers and therefore requires a specific activation using a hidden schemapreview setting. These fields will be included in the next major schema revision. We have added QualityUpdate and IncallQuality messages containing Subnet, TenantId (online only) and, if traceroute is active in Skype for Business, an attribute will give the round-trip time (RTT) for every hop. The latest provided schema definition (SDNInterface.Schema.D.xsd) allows for these new fields optionally. Auditing: EventLog will receive entries for changes to any SDN Manager or Dialog Listener settings as a result of provisioning activities. Eventlogs will also contain warnings 90 days before a (client) certificate being used is due to expire. 0 values: In previous releases, fields containing 0 were ignored, but this release now provides fields containing 0 if 0 is a valid value and if provided by the clients. This allows better differentiation on whether a field was provided at all or not. Activation of InCallQoE: Installing DialogListener on Skype for Business 2016 Server will automatically activate sending InCallQoE reports from all W16 clients. For testing and development, you can also activate InCallQoE in W16 clients if the server is an older version by adding the control files (see Configuring InCallQoE Messages). For details about various threshold levels of InCallQoE see InCallQoE Throttling and Thresholds. Redis: This version consists of an upgraded Redis client. The upgraded client has been tested with Azure Redis as well as Windows Redis 3.0.500. Redis is case sensitive. Subscriber and listener Identifiers and settings names in SDN 2.4 are made case insensitive. Newly created subscriber and listener IDs are stored in upper case. However, prior to the upgrade the data store may contain identifiers in either lower or upper case. It is recommended that listener and subscriber settings be removed and re-added after the upgrade. This is not required if the database is dropped prior to moving to the new version. Microsoft a rendu disponible le Capacity Calculator pour Skype for Business 2015. Une nouvelle version de Skype for Business mobile pour iOS est disponible depuis 2 jours. Mais surtout, semble corriger certains irritants comme les problème de synchronisation des informations de calendrier par exemple. Extended Support lasts for a minimum of 5 years and includes security updates at no cost, and paid non-security updates and support. Additionally, Microsoft will not accept requests for design changes or new features during the Extended Support phase. Très attendu, Microsoft a communiqué de l'information supplémentaire concernant Skype for Business Cloud Connector Edition. 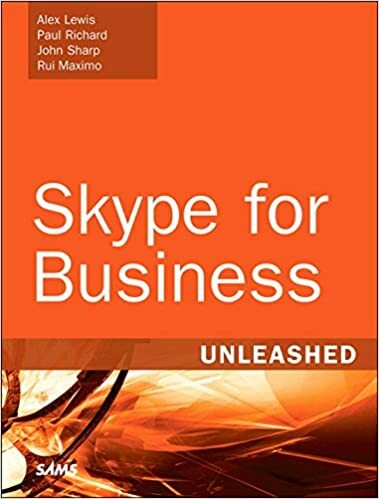 Incontournable, le livre Skype for Business Unleashed est annoncé pour le 1ier aout 2016. Un peu de patience, au vue de la liste des auteurs, on peut s'entendre a une superbe publication. Logitech annonce un nouveau système de visioconférence nommé Logitech Group. permettant d’accueillir jusqu’à 14 participants 20 avec des micros d’extension) Logitech Group. Logitech Group succède à la ConferenceCam CC3000e au catalogue vidéoconférence de Logitech, avec des améliorations essentiellement sur la partie audio. Le système permet d’utiliser les applications de communications unifiées ou de vidéoconférence que les entreprises utilisent déjà. La solution est optimisée pour Microsoft Lync 2013, certifiée pour Skype for Business, et compatible avec Cisco Jabber et WebEx. Le MVP Tom Morgan partage dans les galeries Technet le document "Learn Skype Web SDK in 30 Days". Intéressant, surtout sur un sujet assez peu documenté, le guide comprend de nombreux exemples. En attendant la disponibilité d'un vrai livre sur le sujet. This free eBook is for anyone who wants to get started with the Skype Web SDK. There are 30 "days" (plus a few extras before and after). Each day works through a specific problem and describes how to solve it. In addition, at the end of each day you will see a link to GitHub. This is where you can download a fully working sample for that day to try out in your own lab. - Covers Signing-In, Presence, Instant Messaging, Audio, Video, Conferencing etc. Pratique pour monter un petit lab ou préparer une certification, il est possible d'activer les fonctionnalités CUBE sur une machine virtuelle Cisco Cloud Services Router (CSR) 1000V en version trial. Cisco Cloud Services Router (CSR) 1000v peut être utilisé en version d'essai pendant 60 jours et vient par défaut avec le package Cisco Application Experience (AX) et 100-Kbps maximum de débit. L'infrastructure est basé sur mon lab constitué d'un hyperviseur VMWare EXSI 6.1 sur un serveur physique HP DL380. Mon deuxieme host ne sera pas utilisé. Au boot de la VM, vous allez pouvoir procéder à la configuration initiale habituelle du routeur. 1. Naviguer sur l'url www.cisco.com/go/license et connectez vous avec votre CCO. 5. Choisir la licence souhaitée et préciser votre numéro de série UDI. Pour bloquer l'installation: 3133990, How to temporarily block the installation of the .NET Framework 4.6.1). Vraiment cool, merci à l'auteur pour le partage. Microsoft vient de publier des mise à jours pour Lync 2013 (Skype for Business). 32 bits: Download the 32-bit Lync update package now. 64 bits:Download the 64-bit Lync update package now. Microsoft vient de publier des mise à jours pour Skype for Business 2016. 64 bits: Download the 64-bit Lync update package now. Dans un contexte professionnel de bureau à aire ouverte, Blynclight Mini de Embrava vous permet de propager votre présence Skype à votre voisinage en positionnant cet outil sur un ordinateurs portable ou écran.